BlackBerries were the phone of choice for business users and they have to deal with tons of messages - so the interface has to be very efficient. And the new BlackBerry Hub is as efficient as they come. Perhaps only Windows Phone is close when it comes to unified messaging. The Hub is pretty simple at first glance - a list of messages with an icon that indicates the service (SMS, BBM, email, Twitter or Facebook, PIN, but also calls and voicemails) and also flags messages read or unread (color icons are for unread messages, monochrome icons are for read messages). Messages are indexed by date. Once you start scrolling the list of messages, the bottom bar temporarily disappears to give more screen real estate to the messages. Tap on a message to read it and you can respond to that message from the same screen too. That's great, because you don't have to worry about where a message came from, you just type a response and it will be sent back through the proper channel. More than one message can be selected here, but if you select messages from different sources, only the options that apply are displayed (e.g. you can mark both emails and tweets as "unread", but you can't tag tweets, only emails). The multiple select can be used for mass delete, too. We're covering texting in more detail because it's supposed to be a primary use for one of the rare phones with a hardware QWERTY keyboard. The Messages are organized into threads and use speech bubble UI, both threads and individual messages can be managed by using the long press gesture. You can name a conversation thread, which will help you find it easier later. 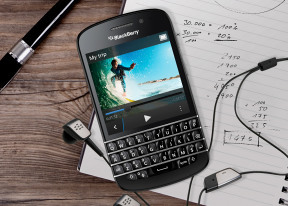 BlackBerry Q10 runs the latest OS, which also adds BBM Video - video calling with a twist. The twist, as you might know, is that instead of footage from the front-facing camera, the phone can stream the contents of its own screen. This way the other party sees just what you see - a great way to show someone how to do something, walk them through a document or anything else you can think of. BlackBerry announced recently the BlackBerry Messenger will launch on Android and iOS, which surely means a huge expansion of its user base. We really hope this bold move doesn't kill the company.